Today is Cinco de Mayo and at Chez Peady, this celebration of Mexican heritage, originating with The Battle of Puebla*, also kicks off “Tex-Mex Week”. It is a favourite tradition of Thing 1 and Thing 2 and we look forward to it all year long. We have a fairly varied diet and, since I regularly meal plan, there’s a lot of opportunity to try new food and taste yummy things from a variety of cultures. Hands down? Mexican food and Tex-Mex win! You already know we have Taco Tuesday in regular rotation (read: every single week until the end of time), but you might be interested to know that we also throw lots of different Mexican (or Tex-Mex) meals into the mix every now and then, too. Right now, my main concern is that *you* might not celebrate Cinco de Mayo (or even know what it is!) and worse, that you might not have dinner plans for today! So, though I will elaborate later tonight and throughout the week, my mission is clear. YOU need a “Tex-Mex Week” menu. I have a “Tex-Mex Week” menu**. Convenient, eh? There’s no better day to share it than on Cinco de Mayo! Fajitas are on the menu and you can totally wing it. Chicken or beef or veggie. The choice is yours. It’s Monday! It’s Cinco de Mayo! There’s no time like the present. I hope you are having a lovely Monday and that, no matter what the weather is outside, you have found a bit of sunshine in your day. I think that Margarita Monday**** should be a thing – especially when it is also Cinco de Mayo! What do you think? Do you celebrate Cinco de Mayo? Do you meal plan? What’s for dinner? Do you enjoy frozen concoctions? If you make any version of the meals on this menu, please come back and share what you made and how it turned out. *You didn’t think it was Mexican Independence Day, did you? Oh dear! Nope. “Diez y Seis de Septiembre” is September 16 and is a beautiful celebration! 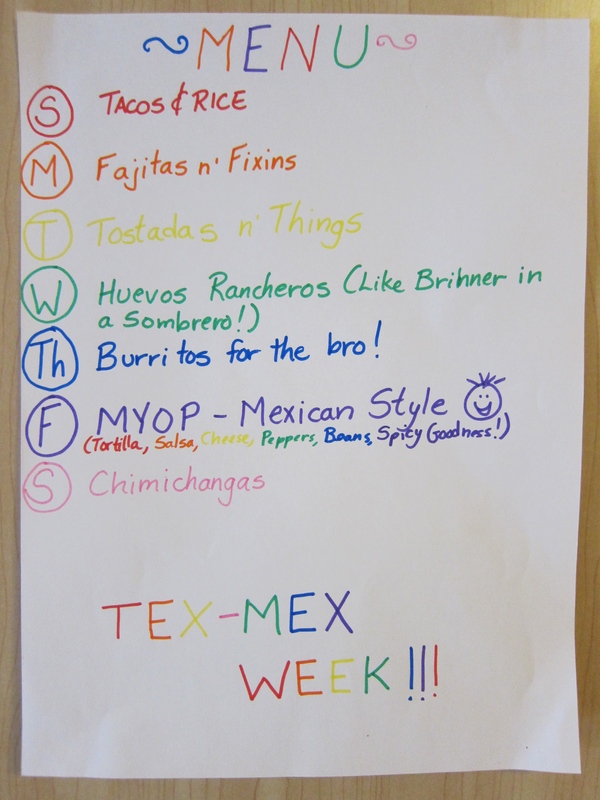 **Full disclosure: This is last year’s “Tex-Mex Week” menu. The Things voted to keep the same one. I took the photo today after I taped it up in my kitchen. ***This awesome sparkly graphic came from here. ****OMG-O-S-H! I really want a Margarita now because this post vanished! *tears* Thank goodness I have a live-in IT department, who is still the nicest boy I know and one heck of a brilliant person!